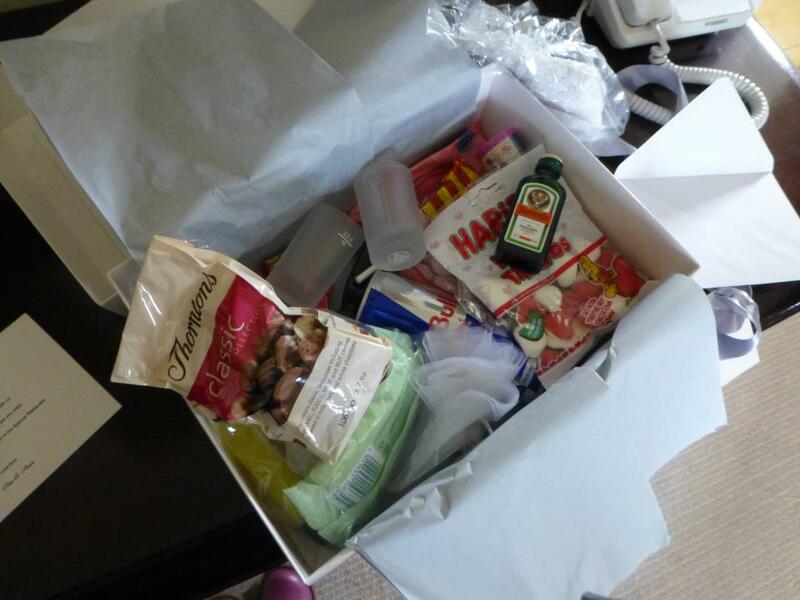 Welcome goody bags in hotel room for guests? Im getting married in September and have most things under control so now trying to iron out the finer details!! Our reception is in a fairly small hotel (53 rooms) of which I am expecting around half the hotel to be guests at our wedding. Has anyone done welcome bags for guests who are staying? And if so what did you put in? Very similar to me. So far I have a 2 small bottle of wine (red/white), a small bottle of bubble bath,a 2 floral tea lights in an organza bag, a little keepsake notebook decorated with peacocks (our venue has peacocks roaming about)and I will be putting some chocolate in. There might also be something else but I can't think at the moment. I may have gone overboard though! I was thinking also some sort of hangover thing? Maybe irn-bru because I'm Scottish, some paracetamol. Something for the post-drinking munchies...? I put small favour boxes with 4 thornton chocolates in each with a hand written tag attached saying thank you for sharing our special day. Please join us for breakfast in the resturant. The hotel put these in the rooms once the evening reception had started. We then had a lovely relaxed breakfast over 3 hours (we dressed up in 'going away outfits) with all our guests enjoying the family/close atmosphere - it remains one of the special times of our wedding weekend. I did think of putting a hot chocolate sachet with chocolates into a mug and wrapping it up with clear cellophane for each over night guest (something similar costs about £7 at thorntons). I saw quite a few suitable mugs in home bargins (e.g. teddy bears, hearts, two cats in love etc.) I would cost each completed mug at about £1.50 if you got the mugs for about 80p. I was going to put a message like we send you a warm hug and thank you for sharing our day. Please join us for braekfast. I just ran out of time to do this as I had swine flu two weeks before the wedding then my future mother in law ended up in hospital over New Year and we spent all our time ensuring she was eating and drinking. That's nice with the note... maybe should do that! We were really lucky with it as you can send for 5 sample boxes and only pay a fivers P&P so the boxes are free!!! I just put in them comfort things after a long day and one thats probably been full of lots of wine! Bottles of water for the dreaded hangover, paracetomols, some naughty crisps, chocolates and biscuits for the munchies and other small bits and bobs like for example my chief bridesmaid has tummy trouble so I put a bottle of gaviscon in hers cause I knew she'd forget it!!... 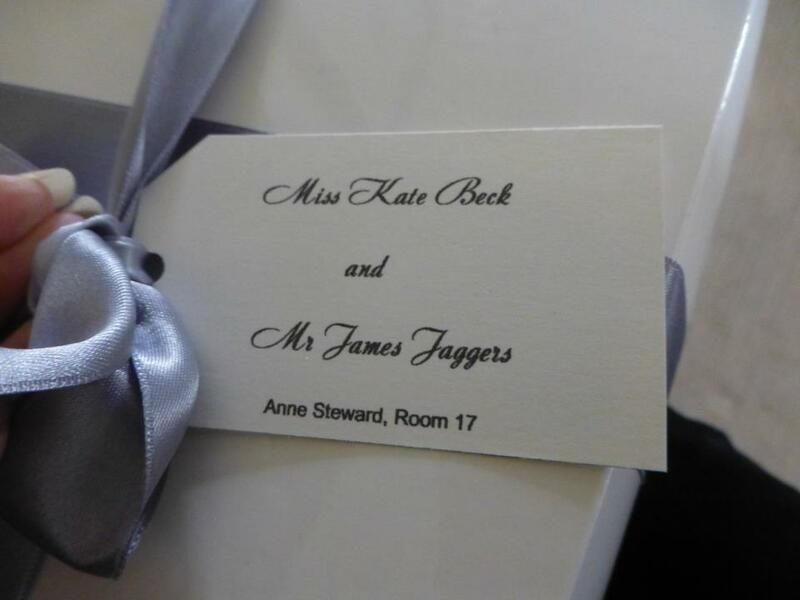 I also put a small note in them and did lovely printed labels addressed to the guests in each room, I then dressed them with a chiffon ribbon and asked the staff to place them in the rooms for us. It was something every guest commented on and it's small tiny things like that which make your wedding stand out.... Be warned though it takes a long time to gather all the bits and bobs and complete the boxes do them in advance and not at 3pm on the day before you get married like me!!! A few of our guests lived a couple of hours drive away so they stayed over.. I did a gift bag with a bottle of water, some headache tablets & some mints & sweets for their journey home the next day. 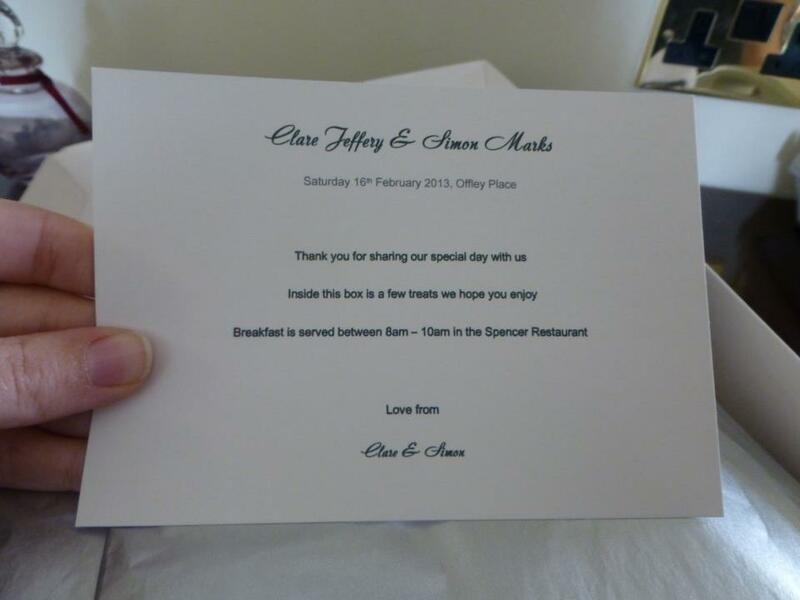 We put a little thankyou card in too saying how much we appreciated them sharing our special day. I got one of these at a wedding and loved it, it was put in our room during the day so was there when we went to go to bed. and a t shirt for us to wear to breakfast the next day. We are starting to introduce wedding day crates for the day and evening venues.The crates are full of sachets wipes,shoe shine,sewing kit,hair pins and so much more. The guest goodies bags are packed full of sachets of shampoo,condition,body wash,hair cap,paracetamol,coffee,tea,vanity set and more. 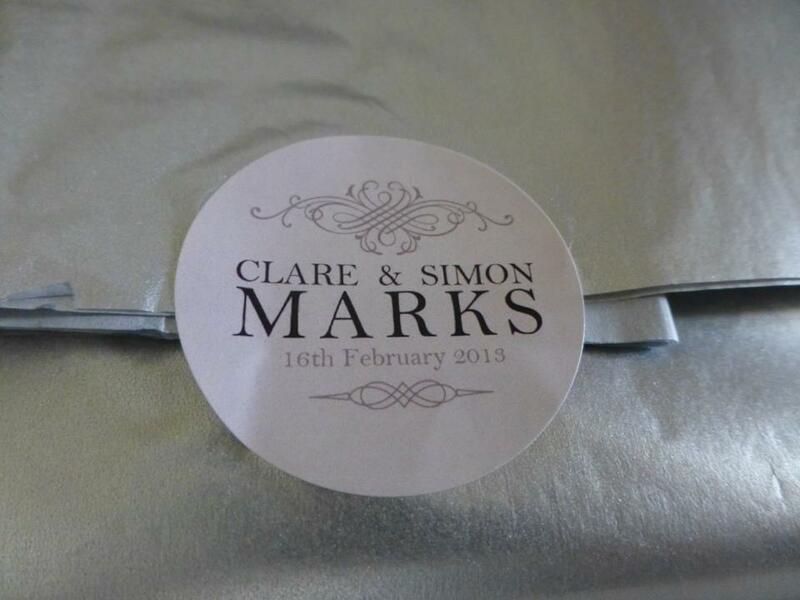 Each of the above can be personalised and added to with customers own ideas. It would be great if you could let us know what you would like to see in the above bags/crates. 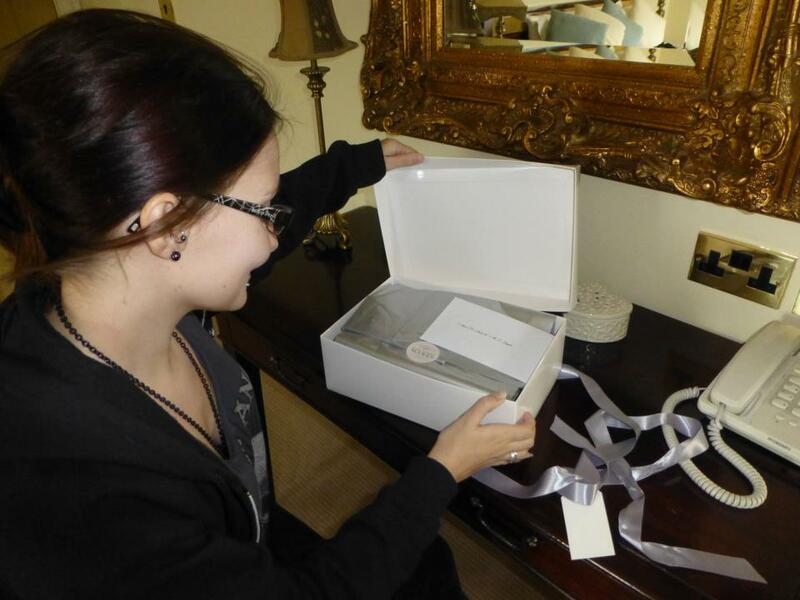 We did boxes in all our guests bedroom they cost between £20-30 per box..
We put in the guests favourite things, drinks, sweets, and other bits and bobs that would be usefull to those guests, went down really well. This is such a fab idea, wonder if we can fit it in the budget, may have 30 or so to do, so definitely bags and most maybe the same with a few special extras for the wedding party - heck I may plant an alarm set to 15 minutes before checking out time in one of the best mans bag, cause if they are put it during the reception its unlikely he will be in a state to twig the alarm is set..............or is that a bit mean? I'm putting together a '' home comforts '' box in the rooms for my guests, because the accommodation at our venue is very basic. I've included things like tea/coffee making items, shampoo shower gels etc, toothbrush/toothpaste, nail kit, hair brush, sewing kit and most importantly, an Alarm Clock so no one is late! ( this is because most guests are staying night before too! Because we're having a winter wedding, I've also put things like slippers and hot water bottles. I'll also be putting in a hangover recovery kit, including a ''breakfast coupon '' inviting them to come and join us for breakfast the morning after the wedding too.